Let us take the guess work out of painting or staining your fence. 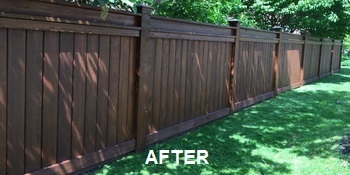 Give us a call today to talk to our fence staining contractors. I didn’t think that my backyard fence would ever look as good as it does now. The City Painters was able to replace all of the rotten wood and helped me find the perfect paint colour that compliments my backyard. I am very happy with the work that was done. The previous painters that I hired did such an awful job on my fence. There were drip marks all over the fence and paint where it shouldn’t be around the fence. I hired The City Painters to re-paint my fence and they did a great job. They even helped me get up some of the old paint that I didn’t think could be removed. CONTACT US FOR A FREE PAINTING OR FENCE STAINING PAINTING QUOTE TODAY! Painting a fence is not one of the easiest projects to tackle however with the right techniques, you can ensure your fence will look its best when you’re done. Here are some quick tips for painting a fence. Preparation– Have a good look at your fence and see if there are any areas that look like they are beginning to warp or rot. Replace any boards that look like they need to be replaced. This will help your paint job look newer longer as well as keep the fence structurally sound. 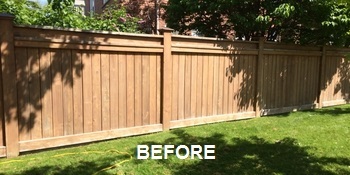 Sand – Give the entire fence a light sanding before you start painting as this will help the paint adhere to the surface. Cleanse– The surface of your fence should be cleaned properly prior to the application of any paint. Normally, power washing the surface should be enough to clean it however if you notice any mold or mildew, you may want to find a cleaning product that you can add in. Choosing the paint– Exterior paint is available in a wide variety of colours and finishes and it is important to choose the right one for your space. Make sure the product that you are using is specifically for exteriors. An interior paint will not hold up to the elements. Application– Using a brush is the easiest way to apply the paint. Use long fluid motions and try to blend any drips before they dry.